How I started, grew, faltered and learned from Press75. By the time I left my 10-year position at the Boeing Company in January of 2008, I had already been playing around with WordPress for several months — reverse-engineering themes and plugins and learning the only way I knew how — the same way I taught myself HTML and CSS years prior. WordPress came easy for me — a minimalist website platform that just made sense — more so than any other platform available at that time. As I wrote and published about what I was learning on my blog, I started to find my own place and following within a growing WordPress community. This ultimately gave me the confidence to leave my job and start freelancing — creating websites for clients using WordPress as more people began to reach out to me with WordPress related work. By the end of January 2008 (in-between client work) I released my first free WordPress theme called “Massive News” which was actually the result of tearing apart, redesigning and rebuilding an existing theme created by Derek Punsalan — an inspiring designer and developer who was doing quite a bit of WordPress related work at the time. I’ve always been intrigued by mobile content design and had been experimenting with creating mobile web designs specifically for the iPhone since its debut the year prior. Responsive web design is simple today, but in 2008, serving up a mobile version of a WordPress theme specifically for iPhone users took a bit more work. In the pursuit of feeding my own curious nature, I designed and released a mobile version of Massive News which at that particular time made it stand out in a sea of existing news-centric themes. As a result, the traffic on my blog grew substantially as well as my client base. By April of 2008, I was already getting fairly burnt out on client work. My clients were typically great people, but I didn’t find the work quite as freeing and fulfilling as I thought it would be. When you’re creating and releasing your own work for free, you have unlimited creative authority which just wasn’t the case with client work. I remember thinking more about “premium” WordPress themes and if I could possibly sustain a living exclusively by creating and selling themes. There were only a hand-full of people actually selling WordPress themes at the time and I distinctly remember Adii Pienaar, Brian Gardner & Cory Miller getting started in the space primarily with news, magazine and business centric themes. Finding my own niche was something I stumbled upon almost by accident. One of my first attempts in designing and developing an actual site using WordPress resulted in a side-project of mine called “TrailerFlick” which was my stab at creating the first minimalist service for streaming movie trailers. 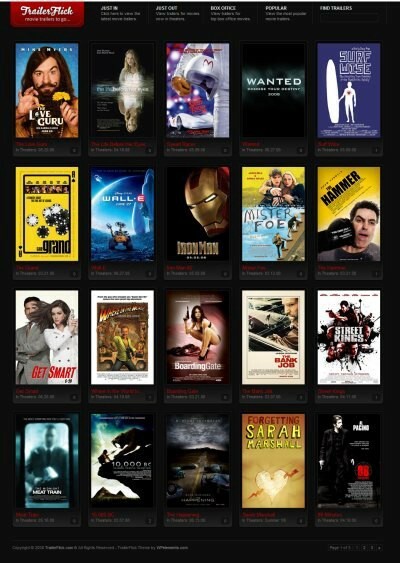 Organized in a clean grid of movie posters, TrailerFlick was simple; click a poster and view a trailer without any distracting advertisements or text. Little did I know at the time that this simple side-project would soon lead t0 a 6-year multi-million dollar business. A new client fell in love with TrailerFlick and hired me to create a similar theme for his cinematography studio. After finishing the work, I requested a final payment but never received a reply. Not wanting to waste a good theme, I considered releasing it for free on my blog, but on a whim, I decided to charge $5.00 per download. Over the next few days, I sold more than 100 copies of the “Video Flick” theme and knew I had hit on something good. Between the months of April and June, I released 2 more “premium” video-centric themes and had grossed close to $8,000 total in sales. I continued to blog and release free themes in an effort to keep fresh traffic coming to the site, but by that time my focus had shifted to building a business. With each new theme release, I raised the price by $25.00, attempting to find the perfect balance of revenue/customers. What I found was that a lower price point resulted more sales and customers, but also much more support. A higher price point resulted more revenue with less customers and less support. Also, the customer who was willing to pay more for a single theme generally required less support over time for the theme that had been purchased. I eventually landed on a $75.00 price point which at the time was the perfect balance I had been looking for. By June of 2008, I was ready to launch a new brand dedicated to selling WordPress themes. I’ve always been a minimalist at heart, and wanted to create a small and personal brand that reflected my own style. 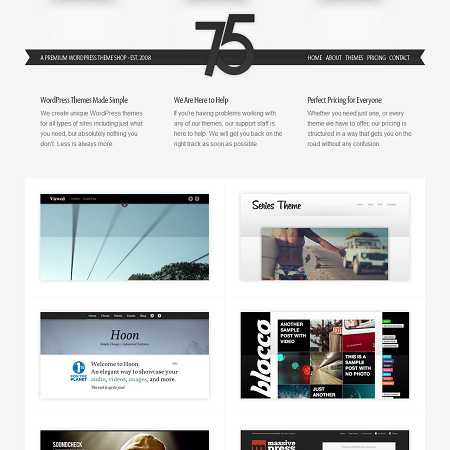 Born in 1975, the name of my business was (still is) “Circa75”, so I chose “Press75.com” as the name for my new theme shop. The commerce side of things was powered by e-Junkie which at the time was the easiest way to sell digital downloads, run an affiliate program and newsletter under one service. 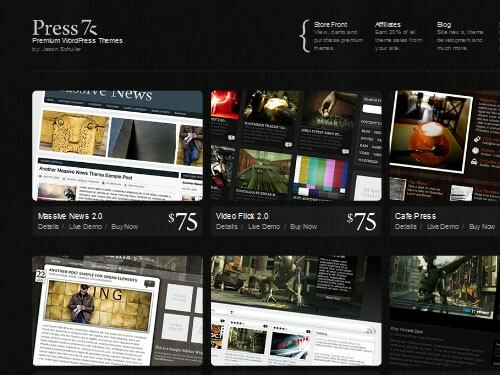 The new Press75.com was simple, elegant and it worked right from the beginning. Things took off quick when Press75 launched on June 9th 2008. Between June and August, gross sales had reached a total of $14,624.00. Time wise, I was tapped out between customer support, updating themes and finishing existing client projects which should have been a clear sign that it was time to outsource, but I continued do it all on my own. Hulu.com had just launched earlier that same year and I had been inspired by its clean design. Interested to see if I could duplicate a similar experience using WordPress, I started working on a new theme I called “On Demand” which was an instant success. On Demand grossed a total of $3,750.00 for the first month after I released it in August 2008 — the result of everything I had learned up to that point including the perfect balance of design, functionality and options. I had fun creating On Demand — it came together easily, without tribulation which was an experience that changed my perspective on how I wanted to work from that point forward. I remember being exited and proud of what I had created, a feeling I hadn’t experienced in years prior to launching Press75. What I was doing didn’t feel like work — I was actively learning every day, creating a product I loved, having fun, making a living and building a vast network of talented colleges, customers and friends along the way. Gross sales for the month of September 2008 totaled $24,110.00 without advertising or paid promotion of any kind. The only marketing tools I was using included RSS and a newsletter periodically sent out to all existing customers. This was officially more income than I ever thought I’d be able to make on my own and by October the idea of client work was a distant memory as my focus was entirely on Press75. Even without the distraction of client work, I was overwhelmed by growth and was having a hard time keeping up with the scale of it all. Handling every aspect of a rapidly growing business, I was all alone from product development and maintenance to customer service and support. Brian Gardner initially knew of me from a plugin I had created which he was using in a few of his own premium themes to create and manage featured content galleries. We met in person at WordCamp San Francisco and continued professional/friendly conversations from then on. Brian was doing very well for himself with his “Revolution” series of themes and I considered him a mentor of sorts at the time. We got along well from the beginning and started discussing potential partnership ideas between August and October. Brian eventually flew me out to Chicago where we spent a few days reviewing options and then came up with a plan to merge our two shops as “RevolutionTwo”. It was a hard decision to make, but in the end, the idea of having a good partner and an established brand/infrastructure in place to maintain and grow what I had already created was an opportunity I couldn’t pass on. 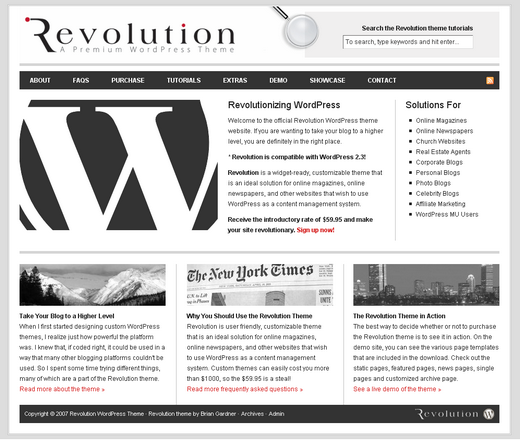 RevolutionTwo.com launched in November of 2008 with a slightly new business model. All themes were free to download under the GPL license in order to better align ourselves with the values of WordPress and the core WordPress community. Revenue came in the form of paid memberships which included documentation and support for a set period of time. Sales were decent, but not quite what we had expected compared to our previous individual ventures. Also, I quickly realized (as I’m sure Brian did as well) that Brian and I were a bit too much alike in all the wrong ways in order to foster a good working partnership. Within a month, we mutually agreed that things weren’t working out and that it would be better to split now, maintain our friendship and go back to our separate ventures. 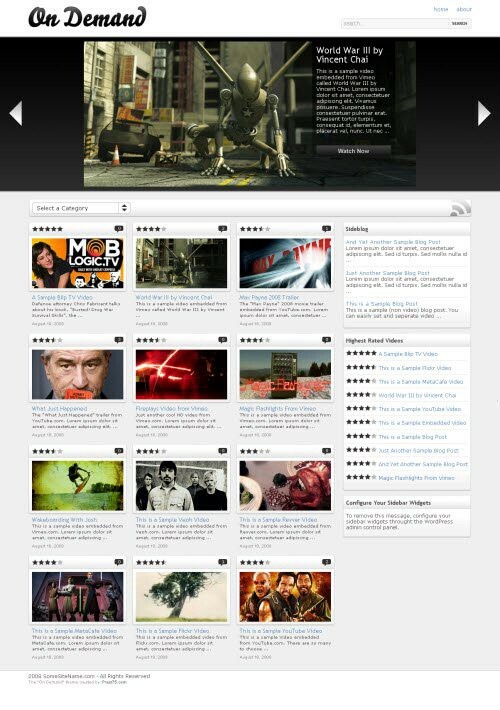 Press75 relaunched on December 17th, 2008 with the same 4 video themes I started with in June. Gross sales for the first month back were $10,695 , less than half that of where I left off in November, but damn good in my opinion considering how fickle I had been in recent months. Having spent the last year creating mostly video-centric themes, getting familiar with different niches sounded like a good change of pace. Within a few months, I released a photography theme and a restaurant theme — both of which helped tip the scales back in the right direction financially and mentally. By March of 2009, gross sales were back up to about $23,000 per month, but more importantly, I was back to doing my own thing, ignoring the competition and overall just having fun once again with what I was doing for a living. Faced with rapid growth for the second time in one year, I decided to hire 2 part-time customer support representatives to help alleviate the time I personally was spending on support. Monthly sales reached a new high in June 2009 totaling $34,675 and then $40,921 in July which officially marked the summit of Press75. Revenue would continue to hover around that range for the next 2 years and I would never be able to grow the business beyond that point from a monetary standpoint. My wife Christine has always been good with managing money and she became very active in doing all the accounting for the business as well as putting as much income away as possible for our future. For the first time in our 10-year marriage, we didn’t have to worry about a paycheck — we were living comfortably (definitely not extravagantly) and we were able to spend more time doing the things we loved. A good portion of 2009 was spent traveling the world with my wife and attending several WordCamps around the country, networking with a wide range of creative people. Inspiration came to me in the company of like-minded entrepreneurs and I remember wanting to immerse myself in that world as much as possible in order to foster new and existing relationships. WordPress became my world that year both professionally and personally. 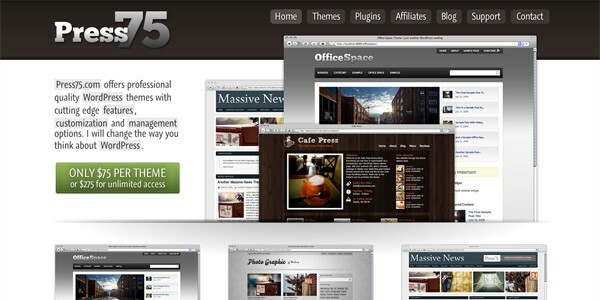 As WordPress became increasingly more complex and option rich, so did the demand for themes. The proverbial “gold rush” of the WordPress world hit and new shops were launching almost weekly with themes that were powered by complex frameworks including endless layout, customization, style options and “shortcodes”. In 2010 I began to focus more on the “bar” that had been set by the market and less on why I started Press75 to begin with. I struggled to create themes based on trends which resulted in a growing library of themes built with varying styles of development as I was learning new ways of doing things. I never had the infrastructure in place to maintain the nearly 2o other themes I had released by that time, so as my time was increasingly occupied by experimentation, maintenance of existing themes began to fall behind. Also, I spent several months redesigning Press75 in an attempt to give it more of a professional look and feel, duplicating what other theme shops were doing at the time. Essentially, I forgot what differentiated Press75 from the growing number of shops on the market and I obsessed compulsively over every aspect of the business which ultimately lead to my inability to manage it in a rational way. During that time, Press75 lost its soul and I began to lose my own way. As 2011 progressed, WordPress continued to grow, but my interest in creating themes wan’t where it needed to be. I found it increasingly difficult to align my minimalist values with a platform which clearly wanted nothing to do with its own minimalist roots. Also, I realized by that point that my focus and energy the previous year was spent transforming my small personal brand into something else entirely. I was frustrated with myself, burnt out, and couldn’t wrap my head around how to fix something I personally perceived as perpetually broken. This perception was mine alone and is a reflection of just how obsessive I can be with anything I create — a trait that can both make or break a business. Press75 was still pulling in between $30,000 and $40,000 per month at the time, but I can honestly say that money has never been a strong motivating factor for me. When my heart isn’t in the right place, my head tends to follow. I created Press75 in the pursuit of making a living doing something I loved to do, but the passion I once had for the business was gone and thats when I started to drift. I met Luke McDonald through an experimental side project of mine called “Theme Garden” which was the first marketplace for selling GPL licensed WordPress themes where 100% of the profits went back to the theme author. Luke had been selling a few of his own themes through Theme Garden and his passion for WordPress reminded me of my own when I got started 3 years prior. It was obvious that he was motivated and ready to create and sell themes which gave me an idea and him an opportunity. Press75 needed a fresh perspective, and I was excited when Luke agreed to be a part of it. 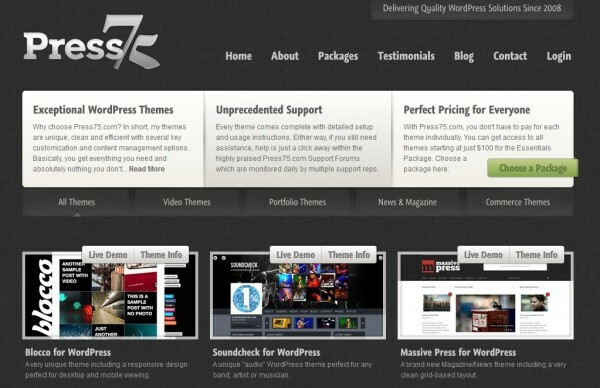 I introduced Luke to my customers and we started selling his themes on Press75 in June of 2011. Our arrangement was simple — Luke would retain 75% of anything he sold through Press75 which ended up being a good deal for him and the business. 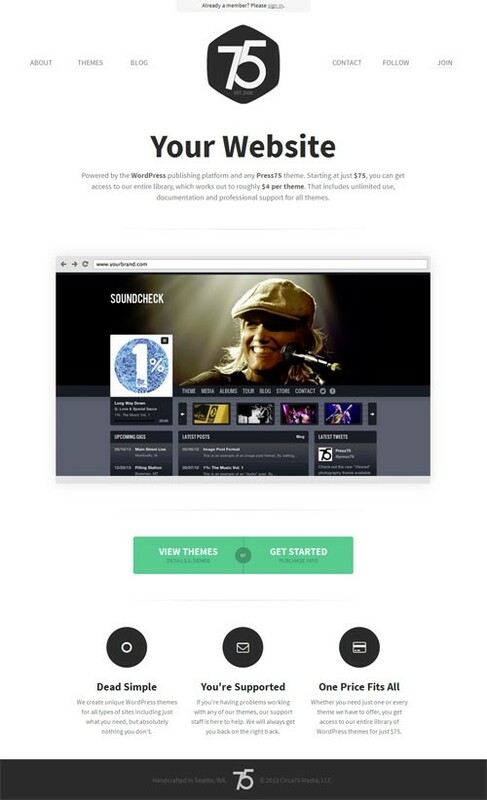 In August, Luke released his first audio theme called “Soundcheck” which was the result of his passion for music. 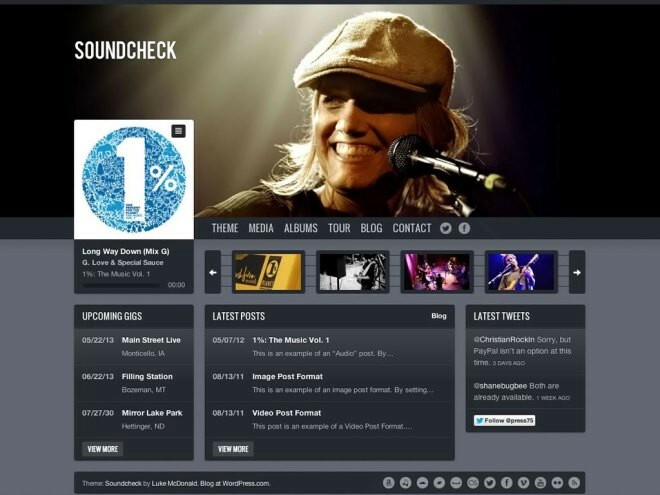 Soundcheck grossed a total of $6,000 during its first month on Press75, and it would continue to grow in popularity from there. Press75 finally had the freshness it needed to survive the next few years, but I already knew deep down that my focus still was not in the right place. As my interests in WordPress and Press75 continued to fade, side projects became an obsession of mine — a persistent calling that would continue to occupy the majority of my time for the next 3 years. Luke was quite a bit more involved in Press75 by 2012 and sales were still decent (hovering around $30,000 per month) which allowed me the time to dabble. Side projects were appealing because I could pour my energy into something I was actually interested in. WordPress had become a monster platform for creating and managing virtually any type of website — I (on the other hand) was interested in creating minimalist platforms that served very specific purposes. A few of these projects included a micro CMS for single-page website templates called Leeflets, a databaseless blogging platform called Dropplets and, more recently, a minimalist video website platform called Cinematico. I even played around with customizing WordPress itself in an attempt to eliminate the noise and bring it back to its minimalist roots. All of these projects had/have small followings, but none of them have shown the potential Press75 did in the beginning. I quickly realized that my perception of how to properly launch and scale a project had been skewed by my experience with my WordPress theme business. With Press75, I just built it and they came — a strategy that surprisingly doesn’t work so well the majority of the time for new ventures. Many stars were aligned just right when I got started in the WordPress theme business — a stroke of well-timed execution that I haven’t been able to duplicate since. I’ll never give up on being an entrepreneur, but the thought that maybe Press75 had been my one-hit out of the park continues to cross my mind even today; especially on the gray days (of which there are many here in Seattle). As I continued to invest more time on side projects, revenue for Press75 started to fade in 2013 dropping by almost 50% from the previous year. Luke and I had established a “partnership” of sorts by that time, but I would never be able to put my heart back into Press75. I felt like I was stuck in a thick fog with no way out. Press75 was clearly on a downward slope, yet I couldn’t even begin to put myself in the right frame of mind to either do the work that needed to be done or find a way out that didn’t impact Luke. Even if I could have, I’m not sure it would have made much difference. The market for WordPress themes in 2013 became extremely saturated as more people started selling themes to make a “quick buck”. Let me clarify and say that I think there are some insanely talented and creative people selling WordPress themes today, but the vast majority of the market has been flooded with trendy themes that look nearly identical (carbon-copied in many cases), with all the typical ingredients needed for a quick sell. 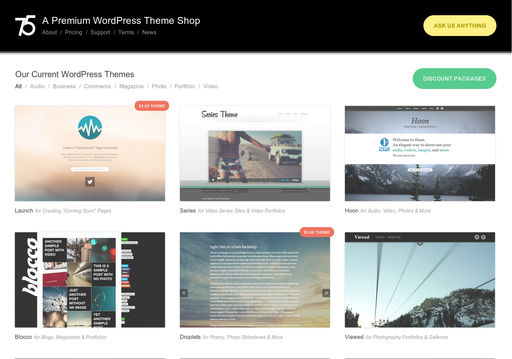 We started releasing themes on WordPress.com (the hosted WordPress service) as well which at the time was a somewhat controlled marketplace. 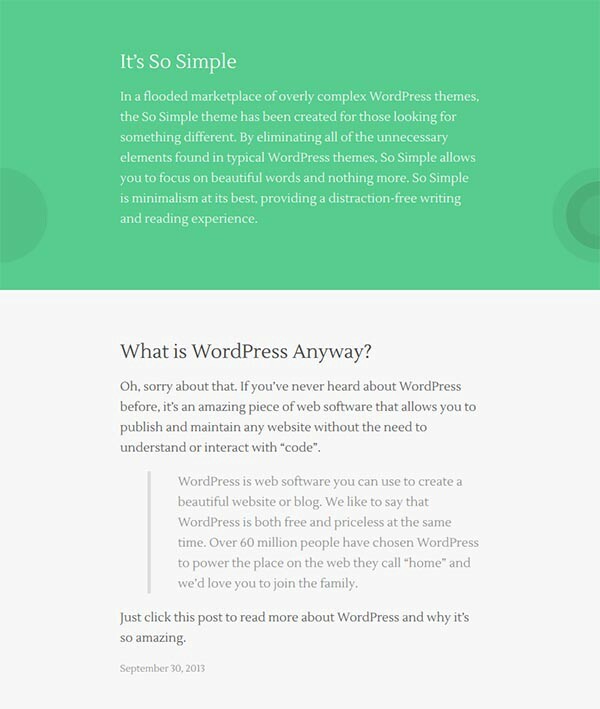 For a brief second, I saw WordPress.com as new ground — a safe-haven for quality vs quantity. Time would prove otherwise and it’s obvious at this point that revenue has become a priority on WordPress.com. In an attempt to re-kindle my love for the business and for WordPress, I forced myself to jump back in and create a few new themes which ended up being a short-lived experience. My focus during that time was on extreme minimalism and typography driven design. I wanted to make WordPress simple again, but WordPress didn’t want anything to do with simplicity. My idea with these new themes was to eliminate all of unnecessary functionality and menus within WordPress that didn’t apply to the functionality of the theme itself. For instance, if the theme didn’t support “comments”, the “comments” menu within WordPress is irrelevant and shouldn’t even be displayed. In my eyes, the is actually the way WordPress (or any CMS for that matter) should work by default — the content of the website should define what the functionality of the platform powering the website, not the other way around. People initially loved the direction, but were generally shocked to see 90% of their WordPress admin disappear when they activated any of these “simple” themes I had created. By January of 2014, Luke had left Press75 (on good terms) to focus on his own venture (AudioTheme) and I was at the end of a 6-year journey. The only way for me to move on as an entrepreneur would be to either close up shop or find a new owner. The idea of closing up shop actually appealed to me more at first because I would be the one to turn off the lights and lock the door after 6 years of profitable business online. In this scenario, I was ready to hand over everything I had created (32 WordPress themes) to the WordPress community and then try and build something new (in a similar space) from the ground up using the subscribers and traffic from Press75 as launch pad. My wife did an amazing job of putting away as much of our revenue as possible in savings and retirement accounts, so I wasn’t worried so much about paying the bills while I worked on something new. Either way, I continued to wonder if there could possibly be a way for Press75 to live on under new ownership. As 2014 progressed, I began to reach out to people I thought might be a good fit for the business. After a few close calls, I finally started chatting with Travis Totz who I had met a few years prior through mutual friends. When we met, Travis was just getting started with WerkPress which is now the leading solution for WordPress theme customization services. 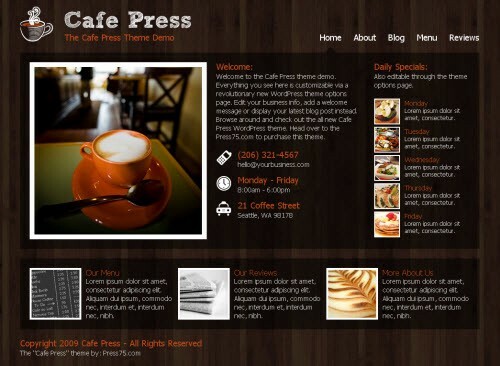 Over the years, Travis and I became friends and WerkPress provided countless theme customizations for Press75 themes and customers. I knew from the first day we began negotiations that Travis and the WestWerk crew would be the ones to carry on the Press75 name and I felt relieved knowing that Press75 was in good hands after turning over the keys in June. It’s easy now to look back and pick specific moments where maybe I should have done something differently, but when you’re in the thick of it, it’s not always so easy to choose the right path or sometimes even the obvious one. I wish I hadn’t let the competition influence my own direction — my focus should have always been to maintain the small personal brand Press75 was meant to be. Also, I wish I would have hired the right people to do the things I didn’t need to do myself in order to focus my time on the things I actually loved to do. These few things alone may have resulted in a different outcome, but in the end, I proud of what I created and am very thankful for the experience. Now that it’s over, I realize that all of the pitfalls throughout this entire experience have revealed major opportunities to improve myself both as a person and an entrepreneur. I’ve learned to embrace all experiences with equal attention on the good and bad aspects along the way, because without that contrast, there are fewer opportunities to become aware of your own potential to grow. I’ve learned never to compare my own journey with someone else’s, to know and be myself, to challenge myself whenever there’s an opportunity to do so, to be content, but also to get uncomfortable in order to actively expand my own understanding and reach. I’ve learned that investing time in people and actively developing relationships is priceless, and I’ve learned to follow my heart, because when you do, amazing things can happen. My wife and I had our first little baby girl last year and she inspires me every single day on so many levels. I look forward to being an inspiration to her and I hope to teach her many things as she grows up. What I never expected is that she would be teaching me right from the start. Every single day, she pushes herself to grow, learn and more importantly, smile, play and have fun along the way. When she falls, she gets back up, sometimes with a tear in her eye, but either way, never giving up on what she wants to do. I plan on maintaining that same approach as I continue the next chapter. Who knows, maybe my one-hit out of the park was Press75, but I‘m pretty sure there’s more to my story.